Engineer has taken up a new hobby this year - brewing beer. He'll have to tell you how to do that another time, all I know is that it pains my perfectly practical soul to see him toss out 6 lbs. of "spent grains." That is, the grains that were steeped and are no longer necessary in the brewing process but are perfectly good. Not just good but actually excellent quality and have been "soaked" already. I couldn't rest until I found something to do with all those grains...well, I could...but I'd be dreaming of all those wasted bits of barley. I found out that if you dried the wheat, you could grind it for flour and/or could dry can it for later use. Since it takes so many pounds of grains to brew, I had to dry them out in batches. Once Engineer had strained the grains, I scooped them into gallon sized ziptop bags and let them sit on the counter until they had cooled down enough to store in the fridge until I could get to them. Preheat the oven at 200F. Lay the grains out in about a 1/2"-1" layer on sheet pans, casserole dishes, whatever you have on hand as long as the pan has a lip/rim so the grains don't roll off the sides. Pop the pans full of grains in the oven for 4 hours. After 4 hours, stir them. Put back in the oven for another 4 hours. Let cool completely before storing the grains. This is part of Full Plate Thursday and See You in the Gumbo. Well thanks Ms. Lydia! You won't have to wait long...next week I'll show you the first thing I did with the grains. :) I have yet to grind them into flour but I have made several recipes using the whole wheat. I would hate to see perfectly good and usable grains go to waste, too. What a great idea! Thanks! 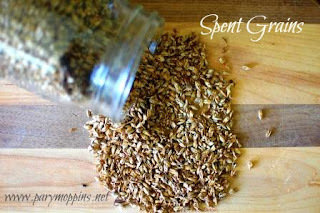 I've had fun playing with recipes using the dried and wet grains. What a great post, and a great idea! Thank you so much for sharing with Full Plate Thursday and have a great week! Thanks so much Miz Helen! It would pain me, too, to have those grains go to waste. Good thinking! Making beer bread with Engineer's beer and your spent grain flour immediately comes to mind! Thanks for linking! Sounds like an interesting way to stay busy. I just got (like yesterday) a grain mill. Those would be perfect. Once they are dry, that is. Oh how I NEED a grain mill. :) Thanks for stopping by Ms. Lynda!